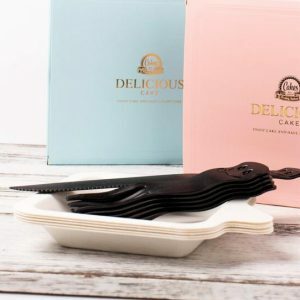 Plastic disposable cutlery Features: Disposable, clean and hygienic, mostly used for dessert. Food grade material, non-toxic and tasteless, healthy and safe. Plastics are macromolecular compounds (macromolecules) which are polymerized by addition polymerization or polycondensation reaction. They are called plastics or resins. They can be freely changed in composition and shape, from synthetic resins and fillers. It is composed of additives such as plasticizers, stabilizers, lubricants, and colorants. The main component of plastic is resin. The term resin is originally named after the lipids secreted by plants and animals, such as rosin, shellac, etc. Resin refers to a polymer compound that has not been mixed with various additives. Resin accounts for about 40% to 100% of the total weight of the plastic. The basic properties of plastics are mainly determined by the nature of the resin, but additives also play an important role. Some plastics are basically composed of synthetic resins, with or without additives, such as plexiglass, polystyrene, and the like. 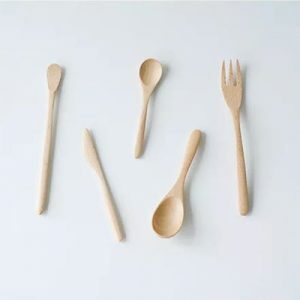 The so-called plastic, in fact, it is a kind of synthetic resin, the shape is similar to the pine resin in the natural resin, and it is called plastic by chemical synthesis. 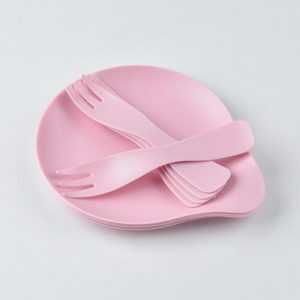 Common plastics used to make disposable cutlery are polypropylene and polyethylene. Relatively speaking, polypropylene has more varieties, more complex uses, and a wide range of fields. The main varieties are homopolypropylene, block copolymer polypropylene (Copp) and random copolymer polypropylene (Rapp), depending on the application. Differently, homopolymerization is mainly used in the fields of drawing, fiber, injection, BOPP film, etc. Copolymer polypropylene is mainly used in household appliance injection parts, modified raw materials, daily injection products, pipes, etc., and atactic polypropylene is mainly used for transparency. Products, high-performance products, high-performance pipes, etc. Commonly used polyethylene can be classified into low-density polyethylene (LDPE), high-density polyethylene (HDPE) and linear low-density polyethylene (LLDPE). Among the three, HDPE has better thermal, electrical and mechanical properties, while LDPE and LLDPE have better flexibility, impact properties and film forming properties. LDPE and LLDPE are mainly used for packaging film, agricultural film, plastic modification, etc., while HDPE is widely used in various fields such as film, pipe, and injection daily necessities. Polyethylene is a typical thermoplastic and is an odorless, odorless, non-toxic, flammable white powder. The molded PE resin is a waxy granular material which is extruded and granulated and has a milky white appearance. Its molecular weight is in the range of 10,000 loa. The molecular weight of more than 100,000 is ultra-high molecular weight polyethylene f UHMWPE3. The higher the molecular weight, the better its physical and mechanical properties, and the closer it is to the required level of engineering materials. However, the higher the molecular weight, the greater the difficulty of processing. The melting point of polyethylene is 100-130C. It has excellent low-temperature resistance. Good mechanical properties are maintained at -60 ° C, but the temperature is between 80 and 110 ° C.
Polyethylene has good chemical stability and can withstand dilute nitric acid, dilute sulfuric acid and any concentration of hydrochloric acid, hydrofluoric acid, phosphoric acid, formic acid, acetic acid, ammonia, amines, hydrogen peroxide, sodium hydroxide, potassium hydroxide, etc. at room temperature. Solution. However, it is not resistant to strong oxidizing corrosion, such as fuming sulfuric acid, concentrated nitric acid, a mixture of chromic acid and sulfuric acid. The above solvent will slowly erupt the polyethylene at room temperature, and at 90-100 ° C concentrated sulfuric acid and concentrated nitric acid will quickly erode the polyethylene to destroy or decompose. Under the action of the atmosphere, sunlight and oxygen, polyethylene will age, discolor, crack, become brittle or chalk, and lose its mechanical properties. At the molding processing temperature, the melt enthalpy is also lowered due to oxidation, and discoloration and streaking occur. Therefore, attention should be paid during molding processing, use, or material selection. Because polyethylene has the above characteristics and is easy to process and form, the recycling of polyethylene has very far-reaching value. 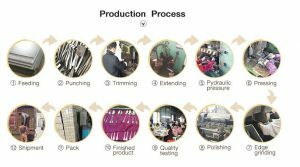 Our cutlery manufacturers offer high-quality cutlery.